Imagine arriving at your winter holiday cabin on a chilly day, stepping over to the wood fire and preparing to get a warming blaze going to heat the room. Imagine finding the inside of the firebox annoyingly damp, with tell-tale signs of feathers and vermin having gained entry, and to top it off, your slow-to-catch fire seems to be sending all its smoke billowing into the room. Now imagine instead a dry, clean fire box that quickly establishes an updraft and delivers a crackling cozy blaze within minutes. The difference is a quality copper chimney cap from Fresh Air Manufacturing Company (FAMCO). It effectively stops rain, snow and other precipitation from getting in, while still allowing smoke or fumes to freely escape out into the atmosphere. Caps can come fitted with a screen mesh, often as fine as a quarter inch, to exclude small animals such as bats, mice, squirrels and birds, as well as leaf litter or other debris. To optimize ventilation and prevent a smoky downdraft, a well-designed cap has features which cause a “vacuum” effect to pull vapors up the flue. One version uses a weathervane function so that the wind itself is harnessed as an aid to vent the chimney. The chimney cap acts like a cowling and protects the flue from storm or other damage. The cap also serves as flashing to seal the gap between the flue and the roofing material. It is important that a chimney cap be made from a non-corrosive metal in order to give a lifetime of trouble-free service. While stainless steel and galvanized steel models are available, a copper chimney cap will certainly enhance the look, architecturally, of most homes. Copper ages gracefully and will provide a natural tone which will complement the rustic or urban dwelling. FAMCO are industry leaders when it comes to providing quality ventilation features for the home. Their range of chimney caps alone covers 24 separate models, with particular emphasis given to the adaptability of each to the type of flue they must be connected to. After all, professional installation and perfect fit are necessary for good performance, so there are round, square and rectangular models available. 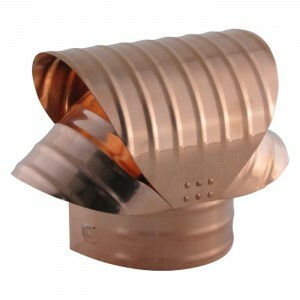 Despite the premium quality of FAMCO’s copper chimney caps, they are extremely affordable. It would certainly be a wise decision to make such a small investment to restore your flue, and your peace of mind.